While visiting tiny Rademin, Mecklenburg-Vorpommern recently we were blown away by the size of the ancient church key. 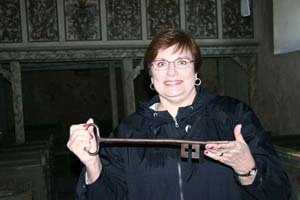 More than a foot long, the key (which the pastor admits is the only one in existence) turns a rusty but still working lock on a thick, wooden door in an even thicker stone and brick wall of the ancient church, built about 1500. Inside, we found a dusty, tiny interior filled with treasures. A pulpit decorated with a painting of the Last Supper (John is definitely depicted as a woman!) and a rear balcony with all of the names of those who contributed to the church when it was last “modernized” with new pews in 1650. It was a highlight of Bill and Kay Ruckle’s visit to her ancestral village.